Where she has followed the dictum to ‘write what you know’ Harrod’s efforts in DEADLY DIPLOMACY are successful. 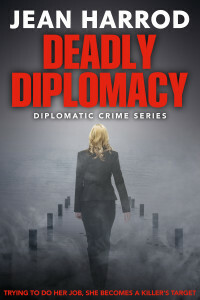 Her many years in the diplomatic service lends authenticity to the book’s depiction of British diplomat Jessica Turner’s efforts to support the sister of a British women who is murdered in Queensland. The victim was involved with a Very Important international trade deal so as well as trying to alleviate the fears of the victim’s paranoid sister Turner must liaise with harried local police and juggle strained high level relationships between private and public organisations. When allegations of corruption and the death of a Federal politician form part of this narrative’s mix, things really do get interesting for Turner and, by extension, the reader. Other elements of the novel were, for me, less successful. The most significant of these was the high body count and violence which turned what could have been a thoughtful story into a bloodbath of the type that doesn’t interest me terribly much. I was surprised to see the Sydney Morning Herald describe the book as a ‘light mystery’ given the number of brutal killings, including a completely pointless (story wise) graphic murder of a teenage girl. The fact that these crimes are being committed by one of the ‘crazed chap who loves killing‘ type of characters makes it worse for me. I accept that nature (or nurture?) throws up one of these nutters every now and then in the real world but not nearly as often as this kind of thriller would have me believe. And regardless of their epidemiological likelihood they are boring. A person who kills because he (or she) likes to kill offers little of interest to a reader looking for character development and motivation. The writing itself is also awkward at times. This is a plot driven book with lots of dialogue to move things along and quite a bit of that dialogue doesn’t ring true. It’s fair enough that Jessica Tuner and the victim’s sister – both English women who have only been in Australia a short time – are not attuned to local speech patterns and terminology but the rest of the characters are meant to be locals. I can’t imagine too many Australians wouldn’t twig early on that this is a book written by an outsider (and one with a different take on social class than most Aussies) but I suppose no one else will know or care. I see that the author’s second book takes Jessica Turner to a different setting and I imagine I won’t know enough about that place to be able to tell if the dialogue is equally out of place so perhaps this really doesn’t matter much in the big scheme of things. The story itself rips along and engages the reader in wanting to learn the reasons for its events and whether or not the victim’s diary will reveal enough secrets to warrant the killing spree its existence has caused. With the violence level dialed down a couple of notches I could easily be persuaded to check back with Jessica Turner and the world of international diplomacy which does seem like fertile ground for great yarns.